With Republicans dominating the the House, the Senate, and Pennsylvania Avenue, the Democratic party's lost a lot of legislative ground. Now, political strategists bearing the capital D are already looking for ways to take home some much-needed wins in the next presidential election cycle. One speculated contender? Former California attorney general and current senator-elect of the Golden State — will Kamala Harris run for president in 2020? 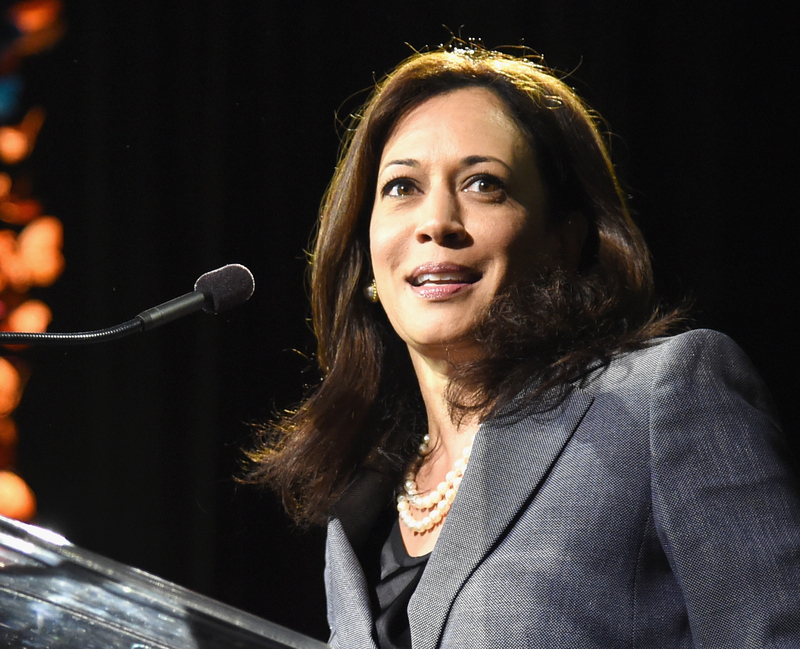 Harris had a big victory in 2016 taking long-time Sen. Barbara Boxer's Senate seat over her competitor Loretta Sanchez, and some are saying she might be making a presidential mark in 2020, as well. On Tuesday, at the Fortune Most Powerful Women Next Gen Summit Harris got high praise during the panel discussion from heavy hitters. According to a report in Fortune, Color Genomics CMO and former White House advisor Katie Jacobs Stanton, Republican strategist Juleanna Glover, and Politico senior Washington correspondent Anna Palmer all championed Harris. However, Harris wasn't the only one considered for presidential potential. The panel also lobbed names like New Jersey Sen. Cory Booker and New York Sen. Kirsten Gillibrand. Although Harris hasn't been sworn in yet, she's already received quite a bit of attention for her historic win — and, really, her historic career. She's racked up quite a list of firsts including becoming the first female district attorney in San Francisco, the first woman to become California's Attorney General, and the first woman of color to represent California in the Senate. As Huffington Post also noted, "Harris is the second black woman and the first South Asian-American to serve in the Senate." Many times in my career, I’ve heard the word “can’t.” Kamala, you said you’re committed to social justice. You can’t be a prosecutor. Kamala, you can’t beat an eight-year incumbent San Francisco District Attorney. It’s not your turn. It’s not your time. You can’t run for Attorney General. It will be too hard, or too much work. I’ve never been a fan of the word “can’t” – aimed at me, or anyone else ... America is a place built on “can,” where opportunity exists for everyone ... No matter how many people said I couldn’t do it, I won my races for District Attorney and Attorney General. I’m a fighter – I’ve fought for the people of California, especially those most in need. And now I’m ready to take that fight to Washington. And a fighter she is, with criminal justice reform, gay rights, and immigration reform at the top of her agenda, she's taken great strides to make a change in her state and the country. Whether Harris will add "presidential run" to her impressive record in 2020 remains to be seen.